Today’s kitchens are the center point of our homes and the most popular of room when it comes to remodeling. Kitchens are also among the most complicated to renovate, as well as potentially the most costly. Return on investment is very high, as is the enjoyment derived from its use throughout each and every day. It’s the single most utilized room in the house and arguably the most important. 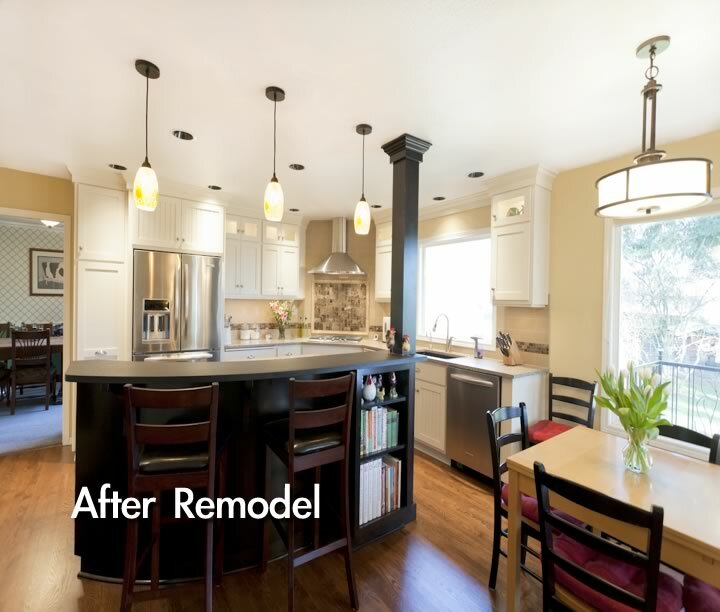 [image size=”medium” align=”right” icon=”zoom” lightbox=”true” title=”Before Remodel”]https://www.designersnorthwest.com/wp-content/uploads/2013/03/kitchen-remodel-before-vancouver-wa.jpg[/image]Many of us have visions of a dream kitchen but are held back from realizing these dreams when we think of the potential stumbling blocks ahead: time, money, aggravation, family disruption, family disagreements, the lack of design knowledge and the lack of resources for finding the answers to all our questions. To help in accomplishing your goals, start with planning. The more planning we do with our clients up front, the less road bumps you will run into during the remodel. Deciding on a comfortable budget that is in line with the value of the house. Practical concerns such as resale might play a role in your decision since you don’t want to over build for your area. The choice of appliances and their respective budget should come first: they will take about 25% of the budget. The cabinetry will be approximately twice the appliance budget at 50% of the budget. The counter tops and floors will be another 10%. Our job is to help our clients establish a realistic plan and work within a reasonable budget. We offer Design Services for all our kitchen remodeling projects. With our computer aided drafting program we can provide our clients with 3D virtual walk through of your project during the design phase of the project.